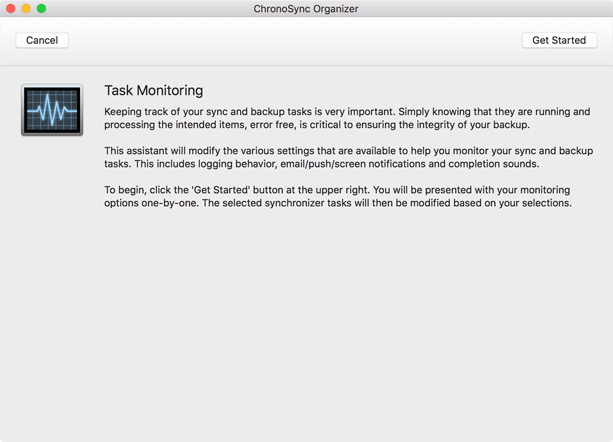 ChronoSync's 'Task Monitoring' assistant can modify the monitoring behavior of multiple synchronizer tasks at once. 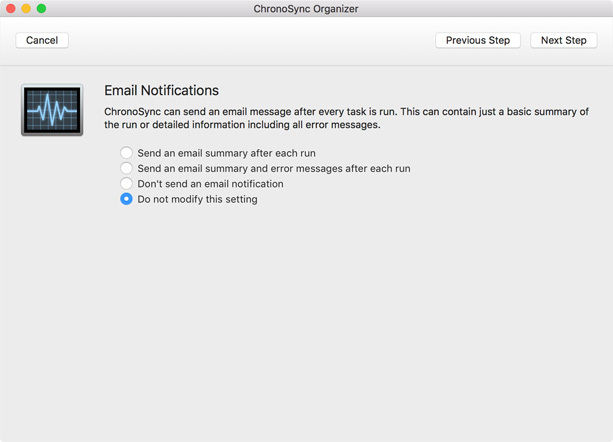 This includes logging behavior, email/push/screen notifications and completion sounds. Options will be presented to you one-by-one and the selected tasks will be modified based on what you choose during the assistant. Keeping updated on the status of your syncs is very important. Knowing that they are running error-free is critical to ensuring the integrity of your backups. 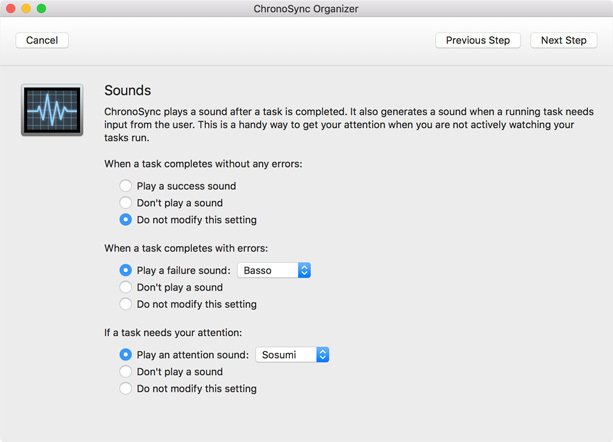 Note that each setting you encounter can be skipped if you do not wish to change it. 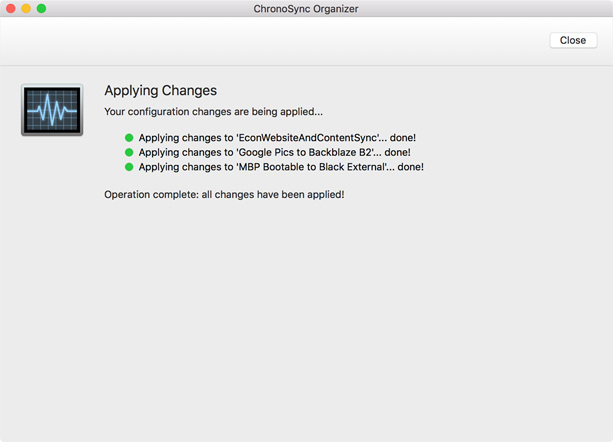 If you are ever in need of changing any of the listed task monitoring settings for one or more sync tasks, the assistant will be the absolute fastest and easiest way to do it. A summary panel will appear to explain the 'Task Monitoring' assistant. Click on 'Get Started' to set up the assistant. 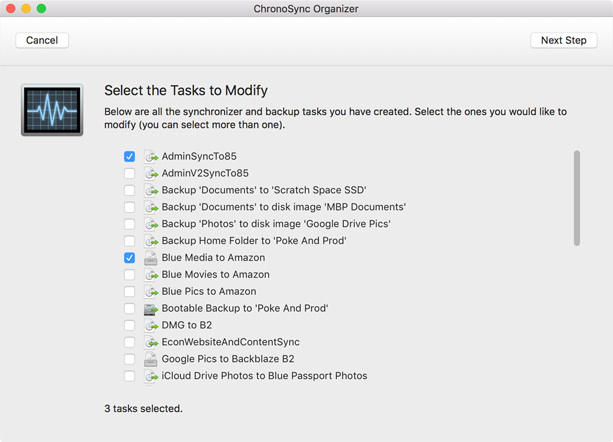 Choose one or more of the tasks in the list that you would like modified. 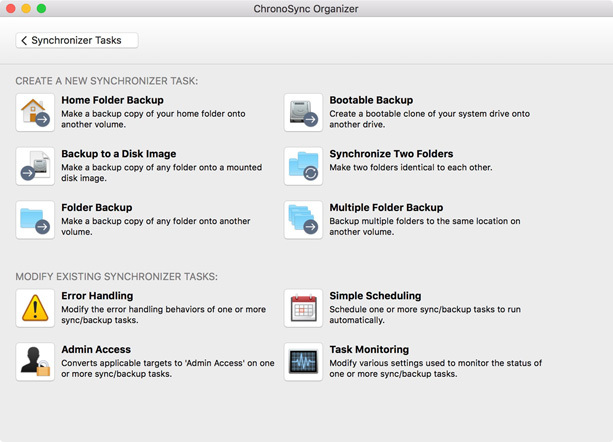 These are all of the backup and synchronization tasks that you have created, including task containers. 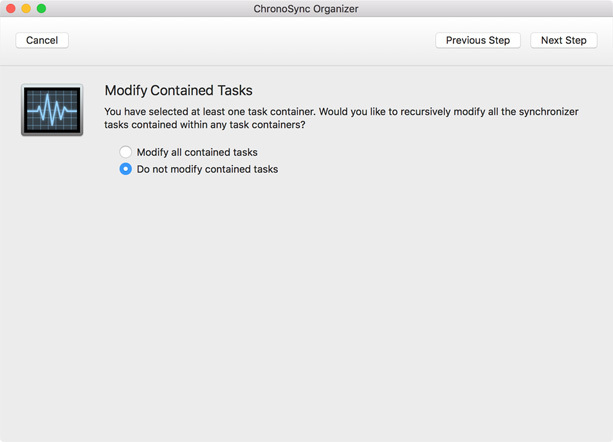 Determine if you would like to modify ALL of the tasks contained within the selected container(s). 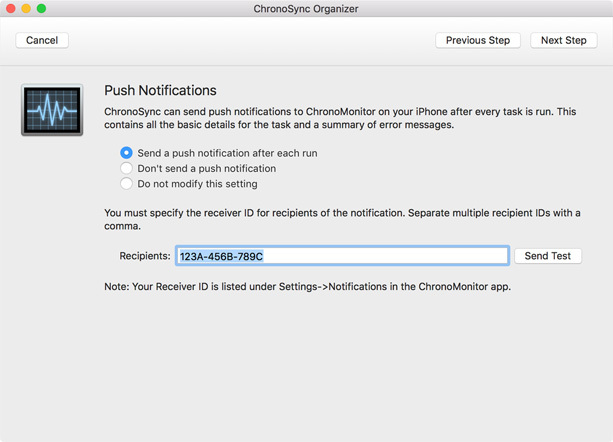 By default, ChronoSync uses screen notifications via Notification Center to notify you of when a task completes. This panel allows you to either keep the screen notifications ON or to turn them OFF. Click on 'Next Step' to go to the next screen. That's it! 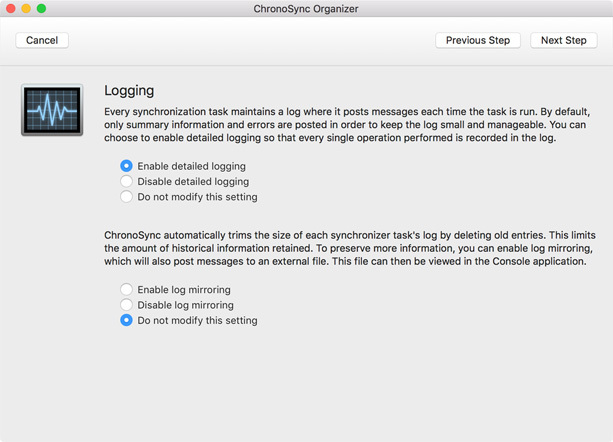 You now have applied task monitoring options to multiple synchronization tasks. 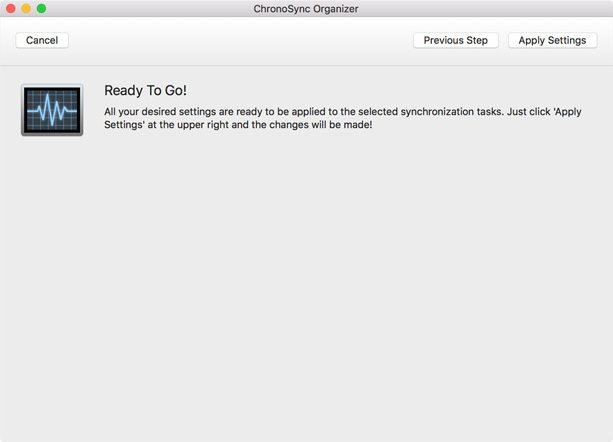 If you need to access any of the tasks in the future, they can be found in the ChronoSync Organizer. Using the task monitoring assistant is pretty straightforward so the above steps should work flawlessly and without incident. If you encounter any problems following this tutorial or you have any questions concerning any of the settings, please contact our technical support team and just ask! We don’t mind — we're here to help!